Hayling Golf Club play the ‘Spoons’ competition for the RNLI. 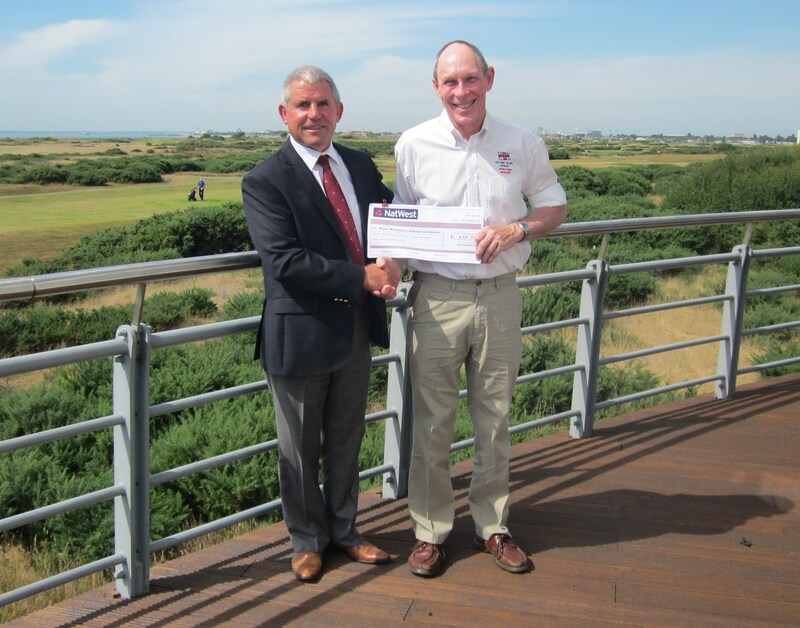 Hayling Golf Club members took part in an 18 hole Stableford Competition in July, and Club Captain Jamie Leggett wanted to ensure this year that the entry fees went to the local RNLI Lifeboat Station. 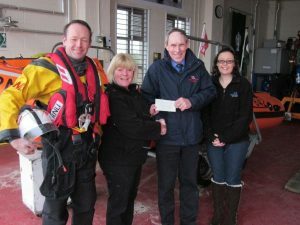 Club Captain Jamie Leggett presenting the cheque to the RNLI Station Manager. 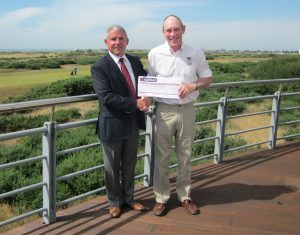 Presenting the cheque to Jonathan Bradbury. Hayling Lifeboats celebrate 100 years of lifesaving. Over 250 guests including current and former crew and their partners enjoyed a wonderful day on Saturday 7 May at Hayling RNLI Lifeboat Station, with superb weather, white port cocktails and over 40 boats taking part in the sailpast. 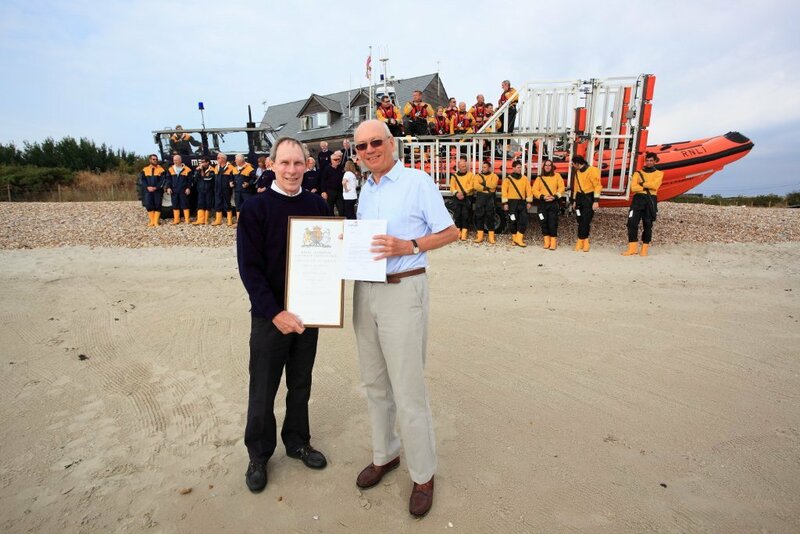 The Bishop of Portsmouth led the re-dedication of the station and its crew, and the Vice Chairman of the RNLI, Stuart Popham who is a Hayling resident, marked the occasion with a Certificate on vellum. He said ‘As a local resident, a sailor, and the Vice Chair, it was a real honour to present the vellum recognising 100 years of lifesaving service by so many dedicated Hayling Island volunteers.’ A 17th century cannon from the Fort Cumberland Guard re-enactment group set the sailpast into action and it was led by the CHC Oyster boat Terror, followed by 4 rowed cutters, 6 lifeboats from Hayling, Portsmouth, Selsey and Bembridge (pictured), and yachts and motor vessels dressed overall in flags. The Station was delighted to be able to thank many supporters and crew members who over the 100 years have launched 2762 times and rescued 1802 people of whom 543 were lives saved. 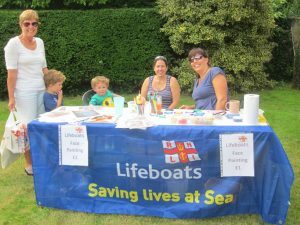 The annual RNLI sponsored fete run in the garden of Mrs & Mrs Taylor at ‘The Haven,’ was once again well supported by visitors who consumed coffee, cake and burgers. The younger visitors had their faces painted! (pictured) They also spent generously on the various stalls and the raffle, the prizes for which were donated by Heidi’s Swiss Patisserie, Southern Co-op Stores, Brittany Ferries, Sainsbury’s (Farlington), Sinah Warren Character Hotel and Wightlink Ferries. We are very grateful to all these businesses for their support. In 2 hours the fete raised over £2500 and we are immensely grateful to Peter and Gusti Taylor for sharing their lovely garden with us. hot cuppa when they return from a cold rescue and so often do the casualties, whose colour and comfort is refreshed with a mug of tea. So either on training sessions or with a real shout the dirty mugs pile up and we all have an aversion to washing 40+ mugs! For several weeks the crisis continued until enterprising crew member Paul Cobon (pictured) went to see Patrick Kean the manager at the Bentley Walker shop on Hayling and asked if they might be able to do us a deal? After discussing this with Matt Walker and dad Anthony, both keen sailors, Patrick was able to make us the wonderful offer of a month old, hardly used dishwasher totally free. The crew are more grateful than words can express and we want to thank Anthony and Matt for their generosity. We will certainly bear it in mind if they ever need rescuing! 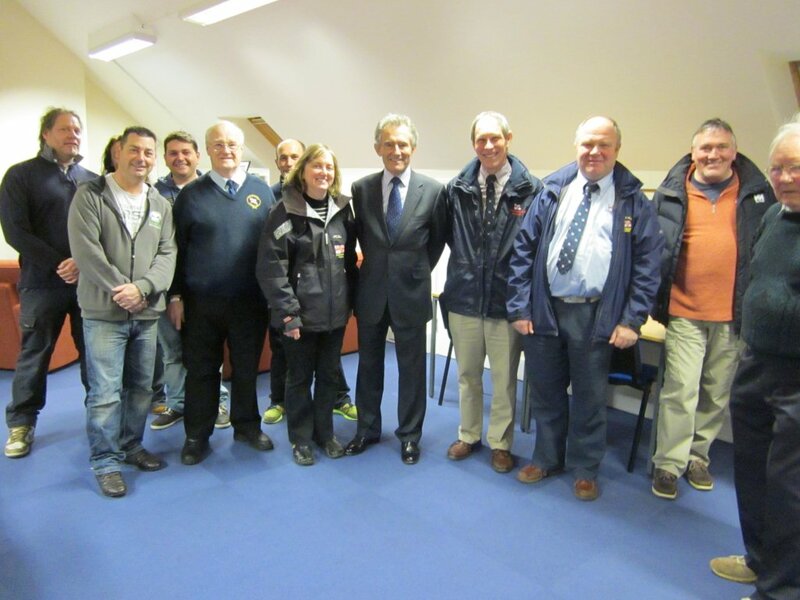 We were very pleased to welcome the RNLI Chairman, Charles Hunter-Pease, when on Monday 2 March he came to Hayling for a fundraising cluster meeting. 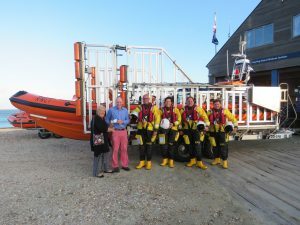 He deliberately arrived early so that he could see the station and meet some of the crew as well as Siri Young, Fundraising Chairman on Hayling (pictured). RNLI Chairman with crew members. We in turn appreciated him taking the time to extend his vist with us given the enormous task he has in overseeing the work of the RNLI. Luke and Tara Skipper are the new managers at the Langbrook Farm Restaurant in Langstone and have raised over £1250 for the Hayling RNLI Lifeboat Station. 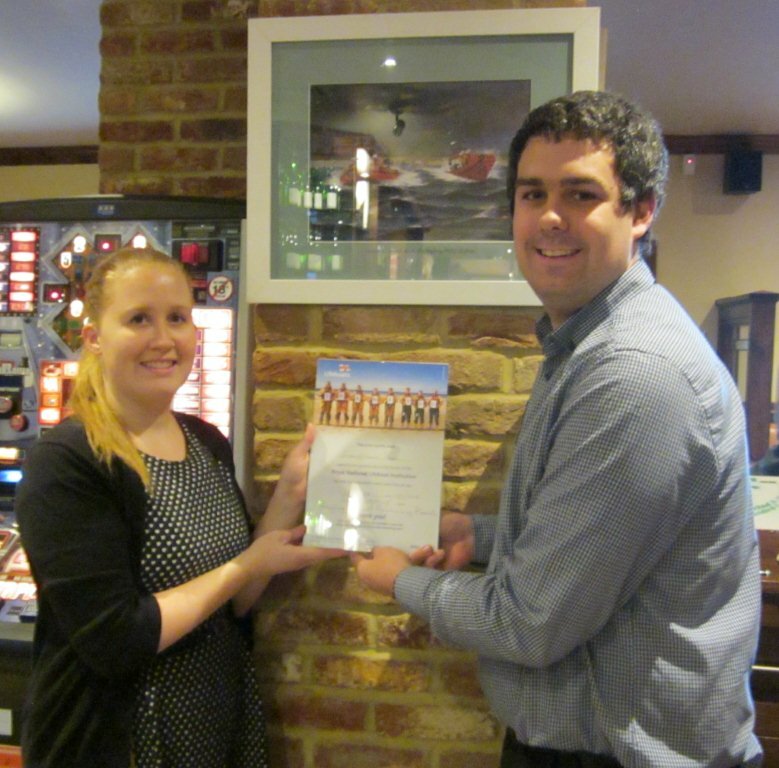 We are very grateful to the restaurant and look forward to a continuing liaison. Their donation will enable us to go on setting out to sea to save lives. Dom and Craig receive cheques from DLA Jules Hewson. 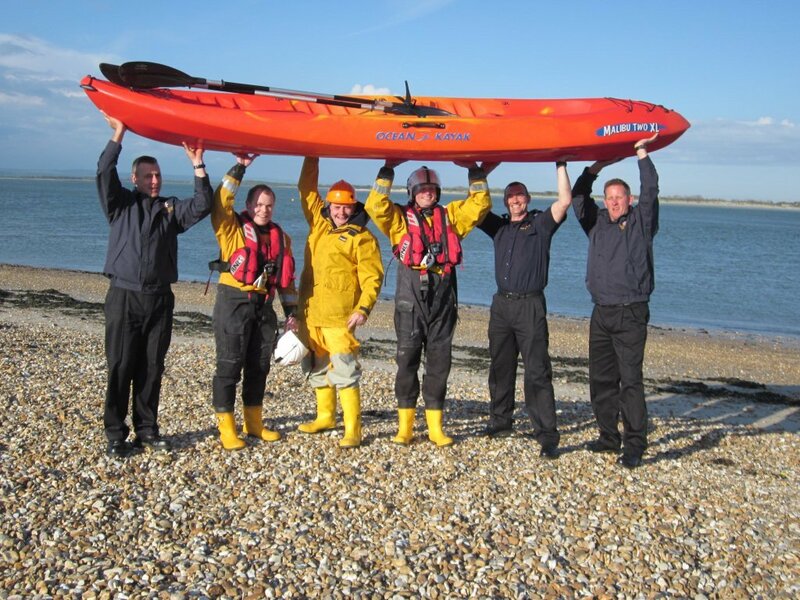 The annual Round the Island Kayak Event (see story below) has this year supported its usual two main charities (the RNLI and Fire Fighters Charity) but also decided to reward supporting services on Hayling. Every year the Hayling Scouts support the Hayling Island RNLI with a number of our open events including the Kayak Event. They lend us, free of charge, a marquee and tables, and several of the lifeboat crew who are scouts, provide the expertise and muscle to erect the marquee and smaller tents. This year two scouts are going to the 23rd World Scouts Jamboree. Dom Allgood aged 16 is heading off to Japan to join around 40 thousand scouts from all over the world and to take part in this 3 week adventure. 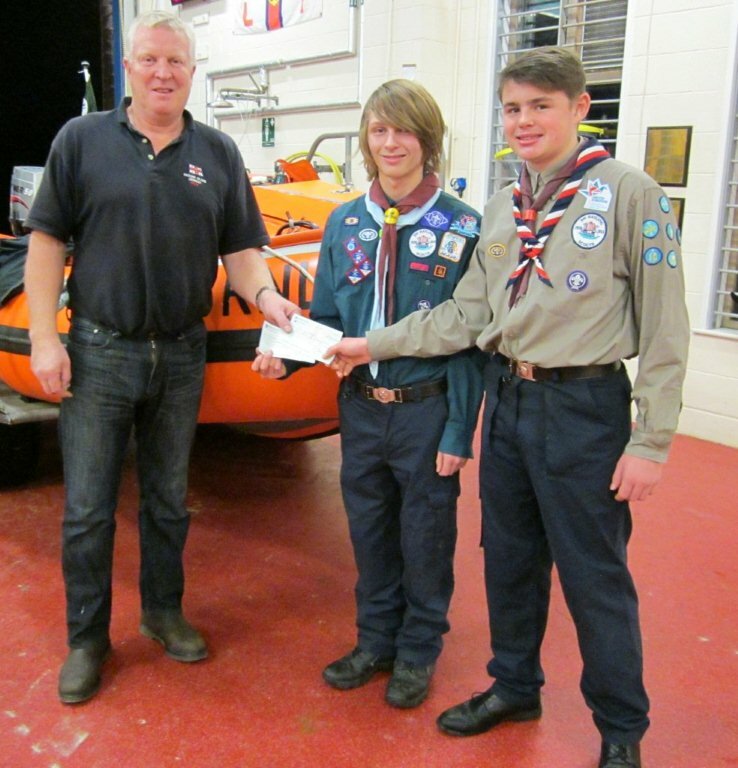 His fellow scout Craig Cooper aged 15 is going to a similar event in Iceland where he will join some 20 thousand others and explore the dramatic scenery. Both are involved in some community service, and will live some of the time with a host family. To undertake these adventures the two boys have to raise £5000 and they have already raised some £4000+. 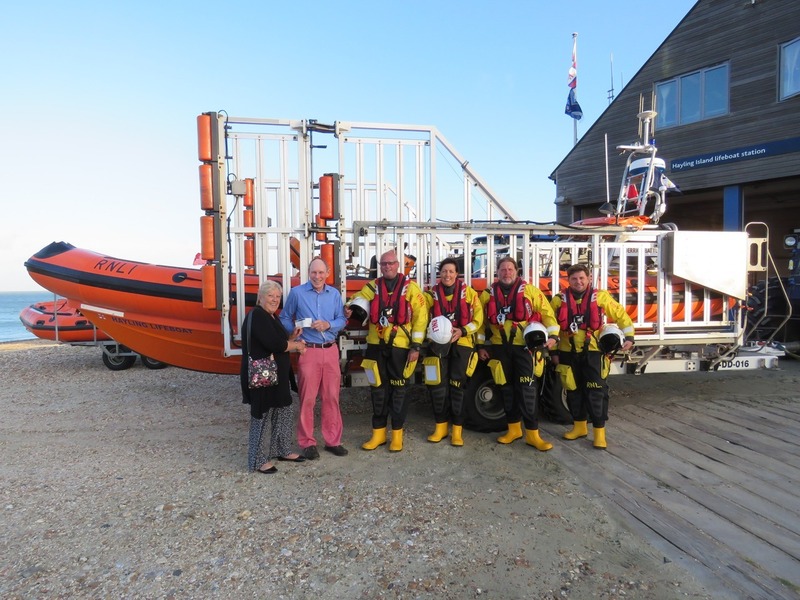 At the lifeboat station (pictured) they were presented by DLA Jules Hewson with cheques for £100 each, to assist them and to thank the Hayling Scouts for their continuing support of the RNLI. 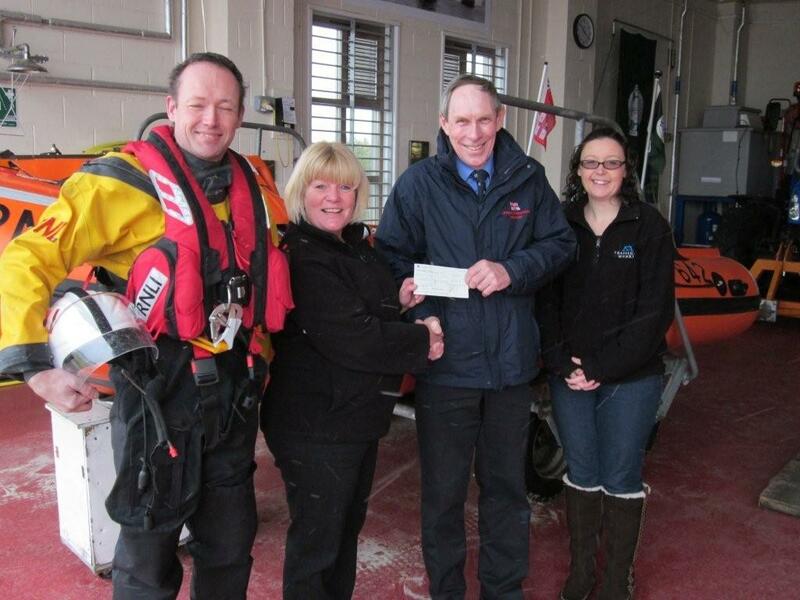 L&S team presenting cheque to the RNLI and Fire Fighters Charities. Last summer thirty-nine kayakers tackled the 18 miles round Hayling Island and have raised a magnificent £4400 for local charities. They presented the cheques this week at the Havant Fire Station. Each year this event, organised by Mark Pannell of the Fire and Rescue Service, gets bigger and this year, in a stiff SW wind, was much more challenging. One team of four from Lift &Shift Waste Management (pictured above) led by Matthew Trace and with Mike Balch, Dominic Sales and Steve Kirby, did the event for the first time and said ‘It was breezy in Langstone Harbour but the team came together and supported each other to get through.’ They raised a fantastic £2500 and were presented with the Oar Trophy for the team raising the most sponsorship. Mike Balch said ‘We encouraged our customers and suppliers to contribute!’ They were clearly very persuasive! 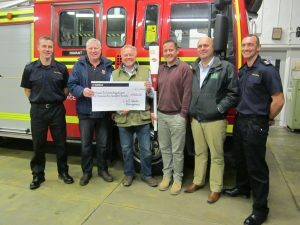 The event has raised £4400 so the organisers have been able to give Hayling Island RNLI Lifeboat Station £1850 and a similar sum to the Fire-Fighters Charity. 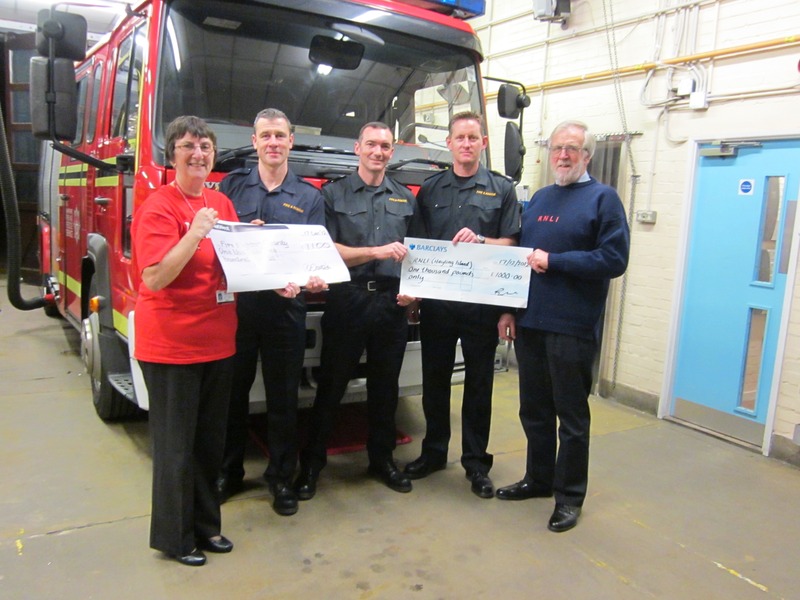 Perry Dodgson and Martyn Elliot of the Fire & Rescue Service and who both took part in the event, presented the cheque to Jules Hewson from Hayling RNLI who said ‘Thank you for this superb donation. This event just gets better and better every year and already a number of the lifeboat crew are planning to take part in 2015.’ A cheque for £500 will go to Frank Dunster who runs Hayling Rescue and some smaller donations to members of the Hayling Scouts to support their adventure challenge. Harvey + friends ride to save lives. 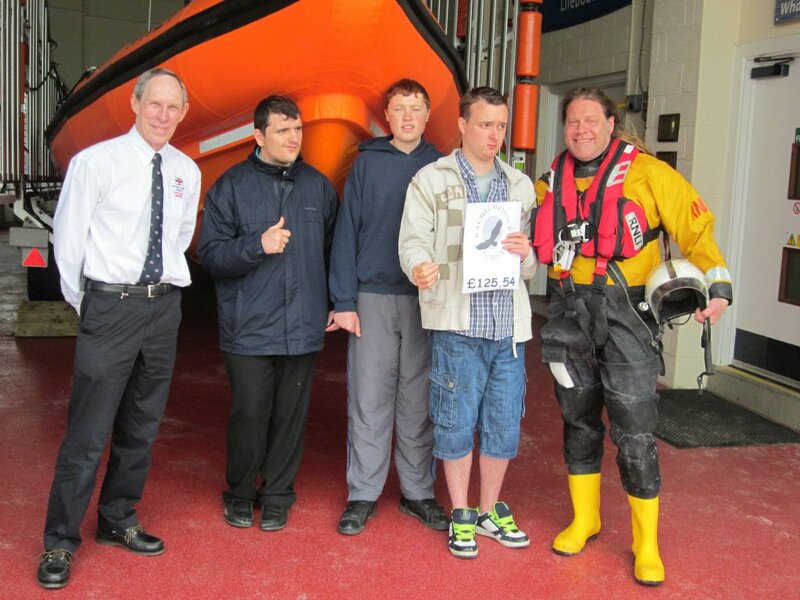 Harvey( 2nd from right) hands the cheque to Jonathan Bradbury. On Saturday 11 October 362 kitesurfers’ set out to sail a measured mile in aid of three charities, the RNLI, Virgin Unite and Snow-Camp. 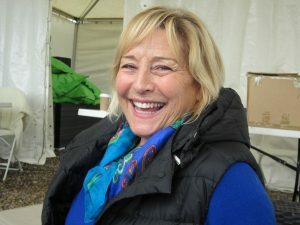 So thanks to Judy and all who took part, and to Dan Charlish the organiser of a very well run event. We look forward to the sponsorship rolling in. 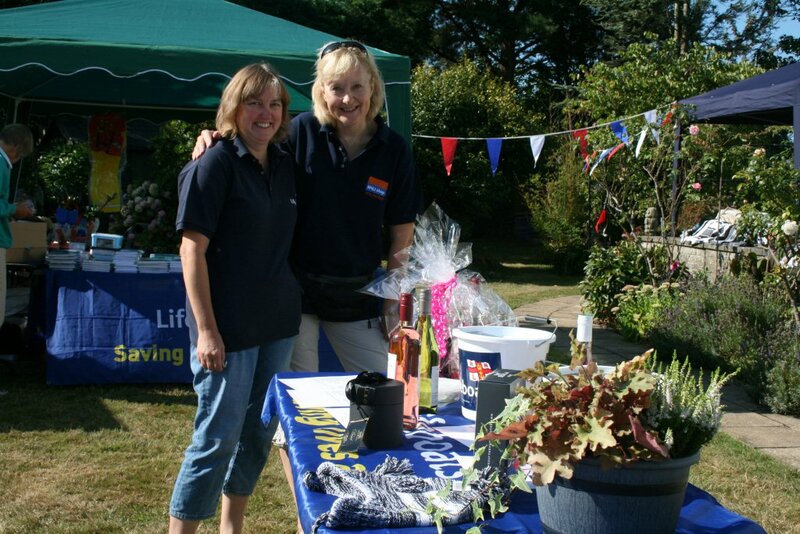 Back in August the annual Hayling RNLI Garden Fete was held by kind permission of Peter and Gusti Taylor in the garden of their house ‘The Haven’ on Hayling Island. The weather was kind to us with hot sunshine and not a cloud in the sky. Once again we were generously supported by a number of local firms including Brittany Ferries, The Southern Co-op, Co-op Funeralcare, Funlands, Heidi’s Swiss Patisserie, The Langstone Hotel, Meadow Farm Nursery, Sainsburys (Farlington) and Sinah Warren Hotel, who all contributed raffle prizes (pictured with the main organisers) to make the raffle a significant event. 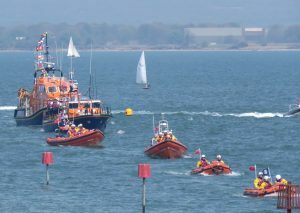 The D-Class Lifeboat and a number of crew were on hand supporting the event which was, once again, very well attended. 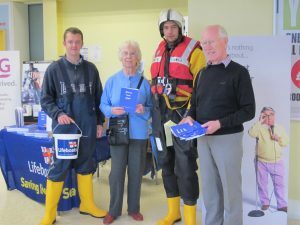 The visitors were faced with a wide variety of quality crafts and items to buy including RNLI merchandise and they clearly dipped their hands in their pockets so that the event raised a grand total of £2750.97. We would like to thank all who came to support us and special thanks to the sponsors and to Peter and Gusti Taylor. We look forward to seeing you at next years event. Danielle hands over the cash. At the Ship Inn Raft Race last July two young enthusiasts encouraged folk to have a go at ‘Stand Up Paddling’ and donate to the Hayling RNLI. Danielle and Phil who run Get Windsurfing, encouraged beginners to try out Stand Up Paddle Boarding by running demonstrations and letting visitors to the race have a go. They simply asked for a donation to the Hayling RNLI Station. The weather was kind to the event with glorious sunshine and a light breeze and so a number ‘had a go’ and their donations added up to nearly £50. Gil Carter praised for his work with the RNLI. Gil Carter is a long standing supporter of the RNLI, and has worked tirelessly for them for over 30 years. 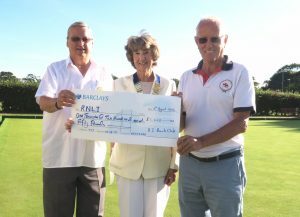 It was in 1982 that Gil and his wife Carol joined the Fundraising branch of Molesey on the River Thames, and he took over as Branch Chairman in 1984, a position he held till 2000. He worked during this period at the London Boat Show promoting RNLI membership, and became the Port Officer for the Annual Kingston RNLI Regatta organising 200 boats, including the Dunkirk Little Ships, from some 20 river clubs. 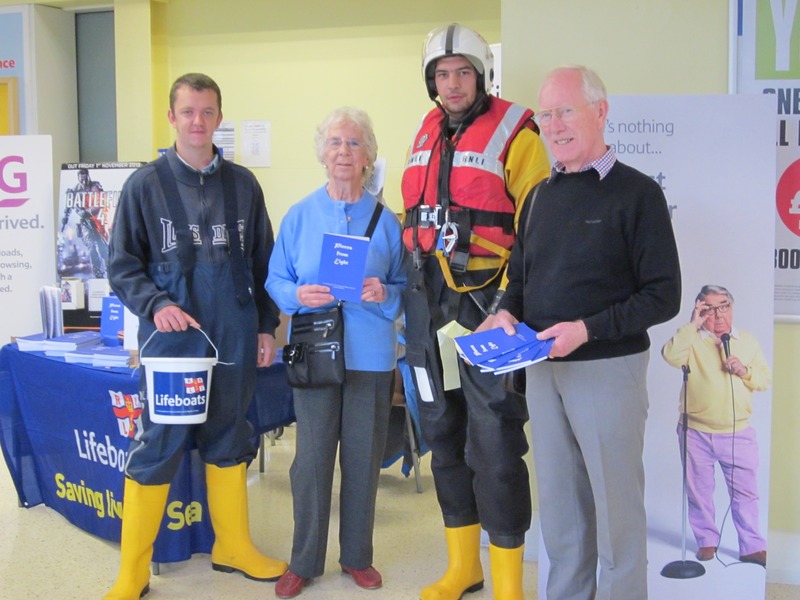 On moving to Hayling Island Gil continued to help with promoting membership both at the London and Southampton Boat Shows and at other events in Portsmouth where he met John Grumbridge who introduced him to the Hayling Island RNLI Lifeboat Station. Gil joined the station in 2002 as shore crew and then became a Deputuy Launch Authority leading a watch team. Later he was persuaded by our current Operations Manager Jonathan Bradbury to become the Training Co-ordinator, which is a complex task and not easy. 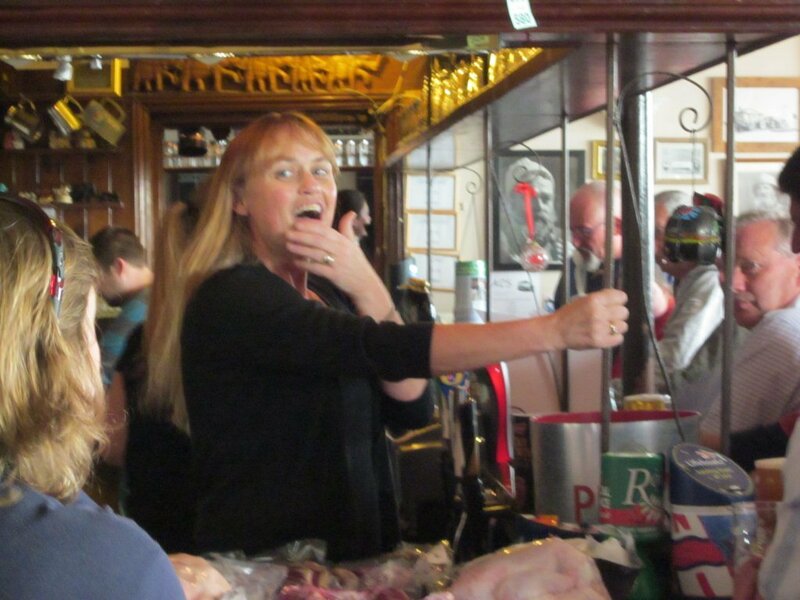 Every Sunday at the Lifeboat Inn on Hayling Island, vivacious landlady Hayley Wallage raffles a variety of meat joints in aid of the Hayling Island RNLI Lifeboat Station. Since starting this in 2002 her efforts have raised over £18000 with nearly £10000 in the last five years. Hayley’s magnificent efforts have been recognised by the RNLI who have presented her with a signed Certificate thanking her for her work. Paul Boissier, Chief Executive of the RNLI, signed the certificate which reads’ The Chairman and Council of the RNLI wish to record their sincere thanks to Hayley Wallage, of The Lifeboat Inn, in recognition of her dedicated support for the RNLI on Hayling Island, raising funds to help save lives at sea.’ Hayley was presented with the award (pictured) by Hayling RNLI Lifeboat Station Operations Manager Jonathan Bradbury and Peter Walmsley Deputy Launch Authority who both praised her tireless efforts on behalf of the crew. Each week Hayley purchases about £80 of mixed meats from butchers Alan Rae on Hayling and raffles 10 items ranging from chicken, duck, gammon steaks, beef to bigger legs of lamb. 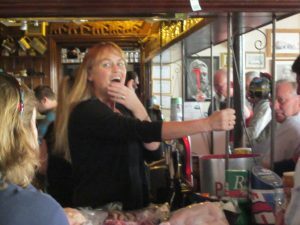 Customers buy tickets at £1 per strip of five and at 3pm the sales stop and the raffle is drawn midst an increasing excitement in the two bars. 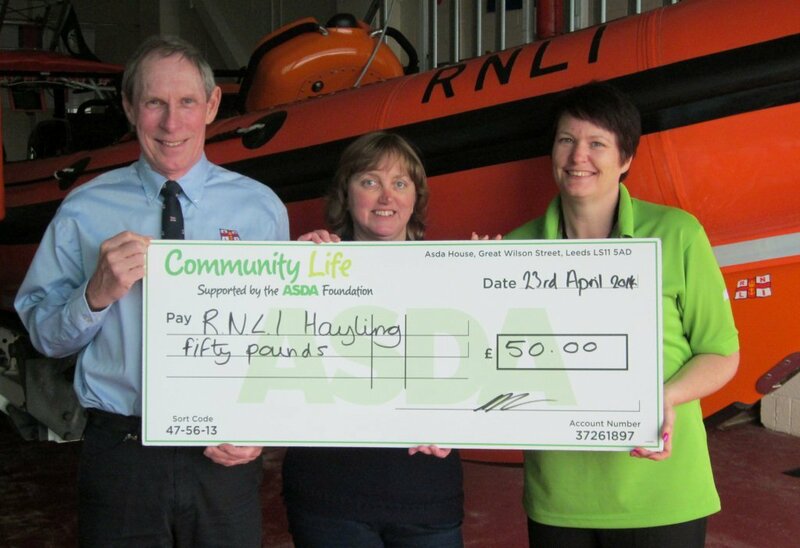 The Asda Store in Havant has been running a ‘Chosen by you …given by us’ token scheme for two months and the Hayling Island RNLI Lifeboat Station has received a cheque for £50. Becky Collins, Community Life Champion explained, ‘When the charities were chosen there had been the spate of very bad weather over the Dec/Jan period and we thought it seemed very appropriate to nominate the local RNLI station. I had recently been on a visit to the station and was impressed with the equipment and the dedication of the crew, all of whom are volunteers.’ Shoppers put their tokens into one of three boxes and each nominee received a proportionate cheque. Eight ladies, all residents of Hayling have written and published a short book called ‘Pieces of Eight’ the proceeds of which will go to the the Hayling Island RNLI Lifeboat Station. The group meet together regularly to write creatively and decided to publish some of their short stories in aid of the RNLI. 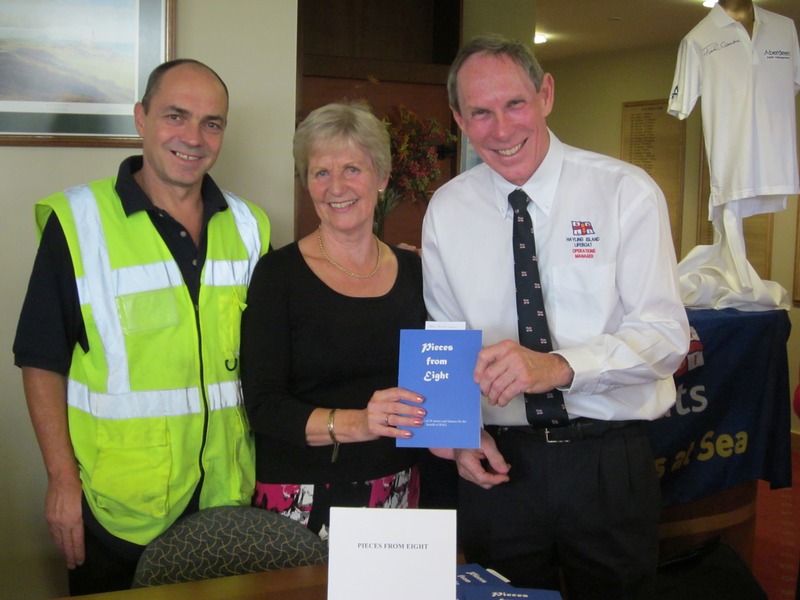 At the launch of the book in early October, Lesley Drew (pictured with crew member Simon Heaver and Operations Manager Jonathan Bradbury ) who leads the group, explained that the writing bit was relatively easy compared to finding the money to fund the publishing costs. By their own fundraising efforts however, and by getting sponsorship they have achieved it. They ran a Table Top Sale, a Coffee morning and also tapped into family for donations, but by far the biggest contribution came via County Councillor Frank Pearce who made use of his devolved community budget to support the group. At the launch books were sold and a shirt signed by Paul Lawrie, a Scottish Ryder Cup golfer, and donated by Aberdeen Asset Management was auctioned which together raised over £200. Books will be on sale at Tesco’s Store in Havant on November 1st and at the Hayling Bookshop from now on. We look forward to the book sales continuing and to this project being a success and we are grateful to the group for choosing us as their charity. They are pictured LtoR Grant, Daphne Vardy the eldest author, Lloyd, and Derek Drew husband of the group leader. The Over-50’s Club in Cosham is for ladies and gentlemen ‘over a certain age’ who enjoy music and dancing in a friendly and safe environment. Each year the Anuual Disco is held and one particluar charity is named as the benificiary. 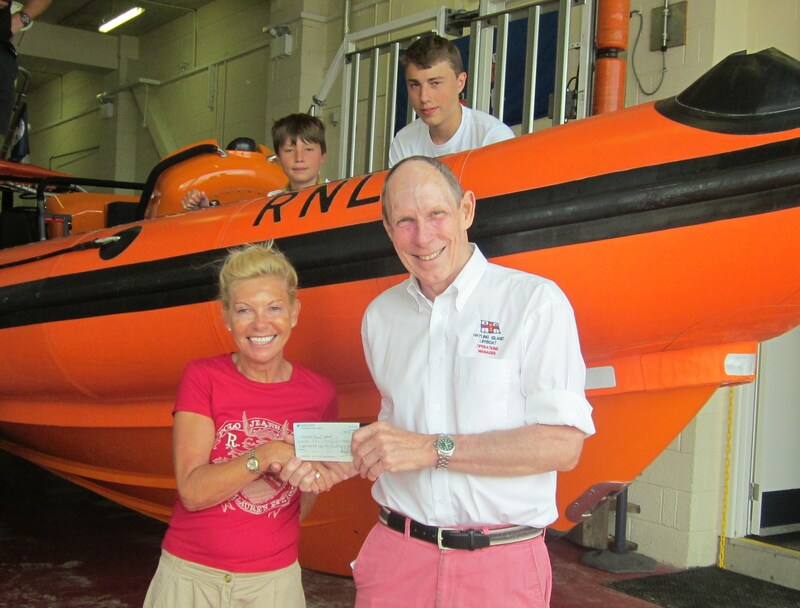 This year organiser Denis Knockton suggested that Hayling Island RNLI Station could be named and the Club agreed. On Bank Holiday Sunday Aug 26 folk gathered and had a good evening of fun, music and dancing and raised the considerable sum of £526 which has been duly presented to the RNLI. We are immensely grateful for this support and thank the club and Denis in particular for thinking of us. 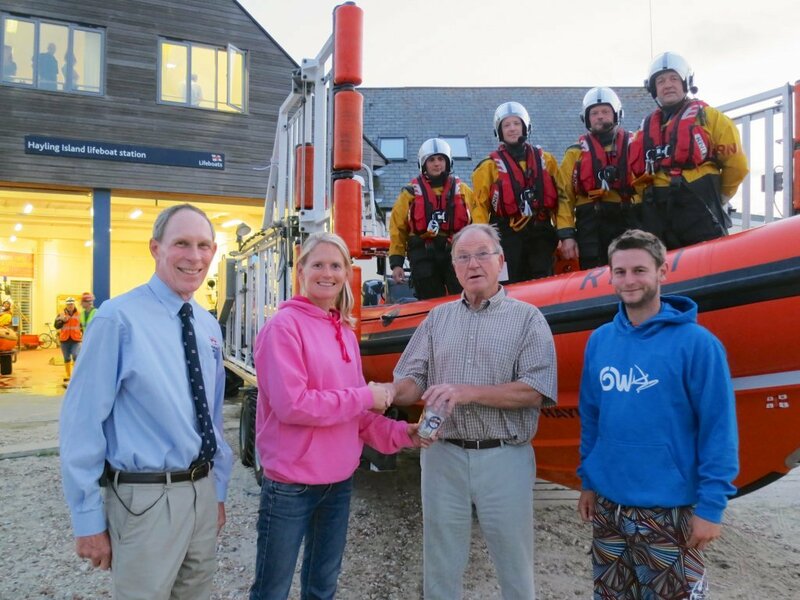 We hope that Denis, who has a boat moored at Northney Marina on Hayling doesn’t need to call on us for help, but if he did he could do so knowing that he and club members have helped to keep our lifeboats and crews active in saving lives at sea. 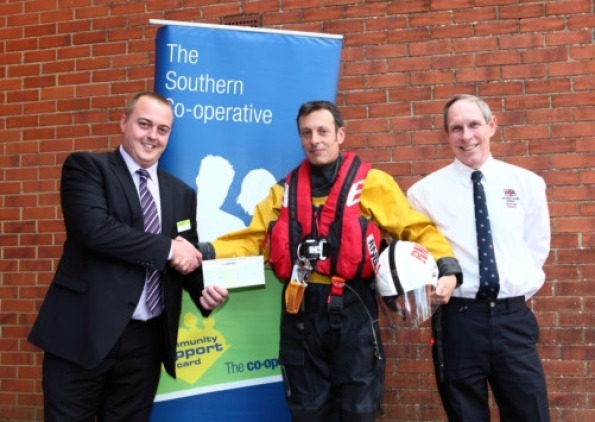 HAYLING Island RNLI Lifeboat Station is immensely grateful to the Southern Co-operative for naming them in this year’s Community Support Card Scheme, which has donated £10,000 to enable the station to continue its work in saving lives at sea. In September last year the Hayling Island Co-op store launched the scheme whereby shoppers carry a green plastic card which is swiped at the tills when they have completed their shopping. Each time, dependent upon the amount spent, a sum of money is added by the store to the gradually increasing ‘pot of gold.’ A target was set of £30,000 to be shared between three charities on Hayling: the RNLI, the First Responders and Chichester Harbour Conservancy. Although by early summer the sum raised was some way off the target, the fine weather encouraged a high number of visitors and locals to shop and use the cards and by late August the target was reached. On Saturday 29 June and Sunday 30 June Lily Sugar’s in Creek Road pulsated to music and all in aid of the RNLI. On Saturday there were a number of local singers who performed through the afternoon and evening, and on the Sunday some live bands were there keeping everyone entertained. The collections for the RNLI raised a superb £506 and we are very grateful to the pub for this wonderful event. Rachel Madocks Special School in Waterlooville has been running a community programme alongside the charity MENCAP with its post-16 year old students. 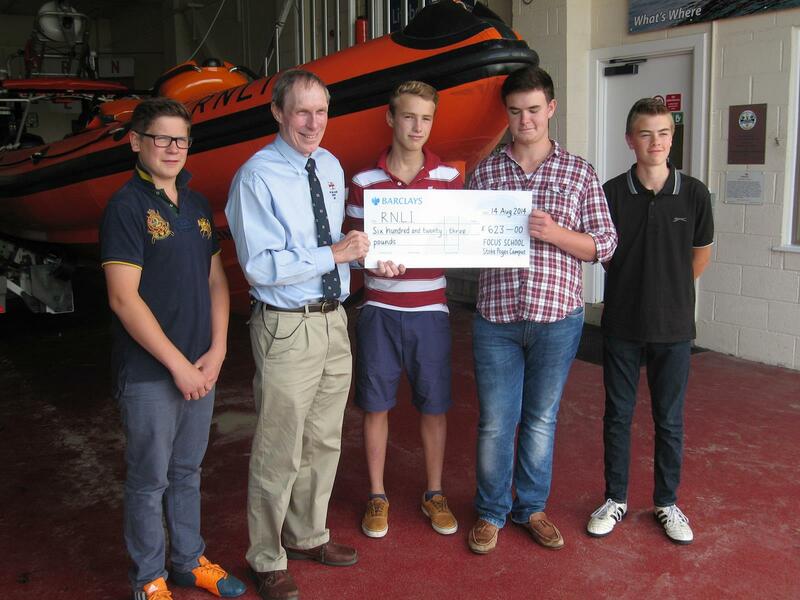 As a part of this the students have been making and selling cakes and one of the students Bradley Denton (pictured holding the cheque) insisted that the proceeds of this should go to the RNLI at Hayling. With the donations received they raised the magnificent sum of £125.57 which they brought to the Station recently on a visit. 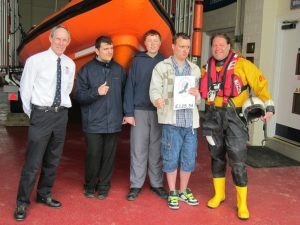 One of the station crew Graham Chapman (far right in the picture) works at Rachel Madocks and said ‘The students have been really motivated to make the cakes and raise this money.’ Jonathan Bradbury RNLI Operations Manager gratefully received the cheque on behalf of the station. RNLI and Fire Service raise the kayak! 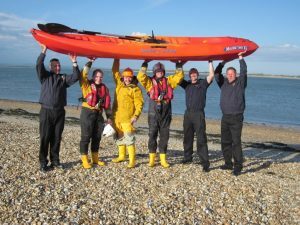 The Hampshire Fire & Rescue Service once again organised the round-the-island kayak event supported by RNLI crew members in their own boats. Last year the event raised over £1000 and a bigger entry of 44 took part this year on a very sunny, hot, calm day. The sponsorship money will be split between the Hayling Island RNLI Station and The Firefighters Charity and looks like being over £3000 this year. The participants paddled anti-clockwise the 18 miles round the island, starting and finishing at the Lifeboat Station, and were very grateful in the heat to pause at the two en-route resting and refreshment stations to take on water and sustenance. This year all the 44 participants finished the course including the oldest, 76 year old Jim Shine, and the youngest teenager Tom Burgess with his dad Tim who is in the Fire Service. Well done to all who took part and to the organisers, and to whoever arranged the fine weather! 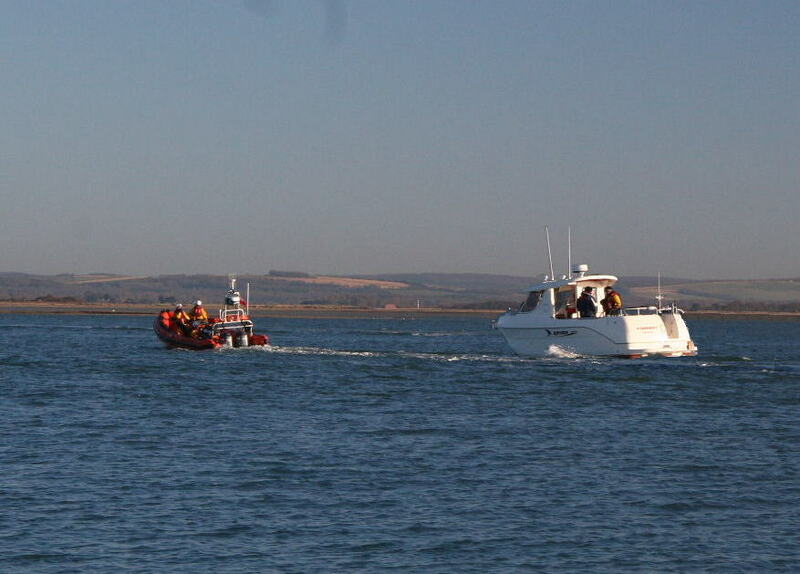 On Sunday 28 April Portsmouth Atlantic 85 lifeboat joined the two Hayling island lifeboats in a joint exercise. Volunteer crew from both RNLI Stations became casualties for the day and presented various problems to the rescuing crews. The day started with a ‘sailor’ on his boat in Mill Rythe with a nasty broken leg. He was carefully treated and splinted to bring him back on the lifeboat and then transferred to the shore crew to continue treatment. He said later that the way the crew dealt with him was excellent. Almost too soon after this for any relaxation the crews were called out to go and investigate a life raft with seriously ill casualties two miles south of the Beacon. On arrival it was found that there had been 8 on board the yacht but only 7 were in the life raft and one of these was beyond help. Others were unconscious and hypothermic and so all three lifeboats were involved in dealing with this major issue. 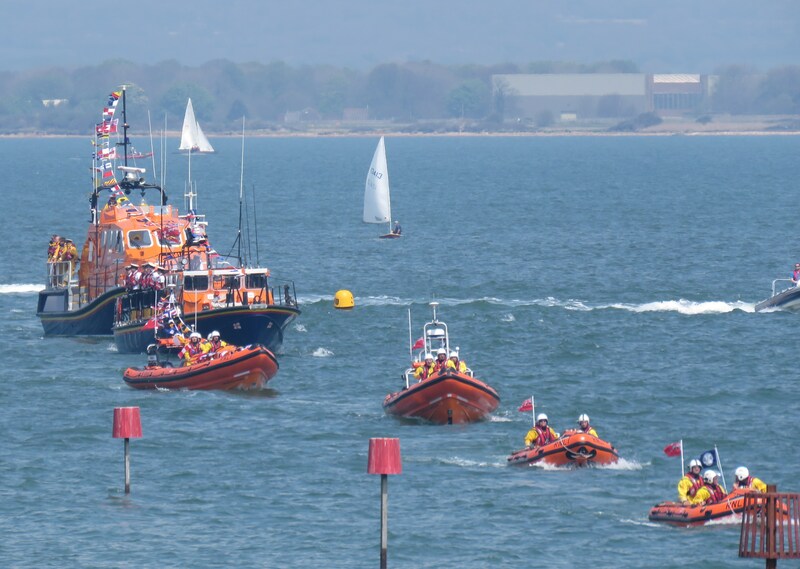 One lifeboat immediately started a search for the missing crew member and continued to do so for some time using standard search techniques. 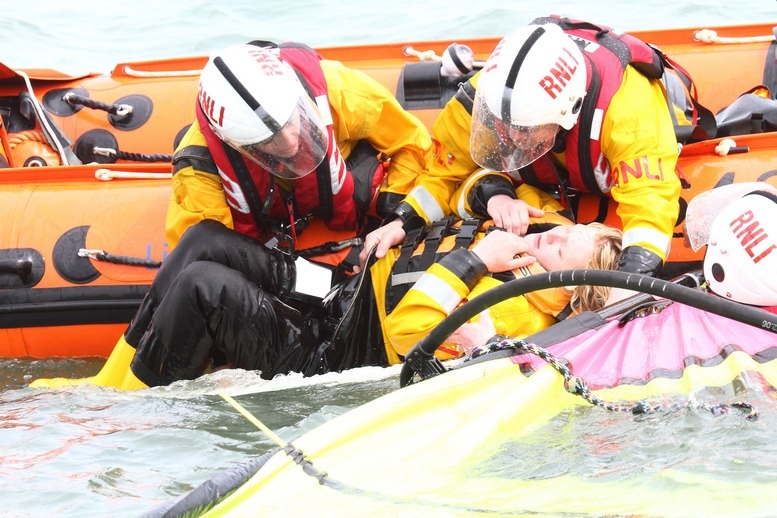 Casualties were treated at the scene and transferred to lifeboats who took them back to shore for further treatment. Once again the crews were seen to use good judgment and appropriate first -aid techniques in dealing with this complex issue, and we are pleased that ‘Fred’ was found in the water and rescued. Finally a windsurfer (pictured) with severe hypothermia was rescued from the harbour and brought ashore again using standard practice for slow warming and recovery. She too praised the work of the crew. All this happened under the eyes of observers who looked both on the water and ashore for the right actions and for any lessons to learn,and this was fed back to the crews immediately after the boats had all returned. 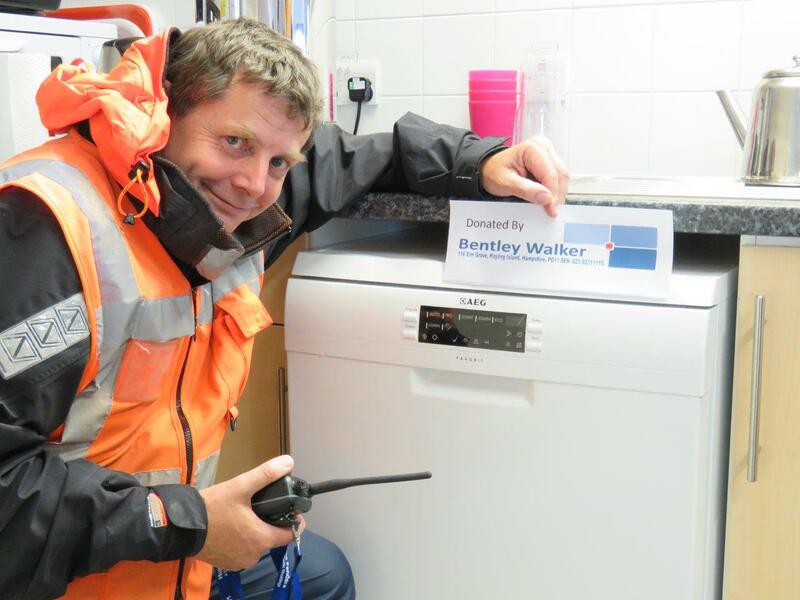 Portsmouth Operations Manager praised the Hayling Station for it’s efficient management of a creative exercise and especially the work of crew member Jamie Bray from Hayling who masterminded this event. He also said how valuable it had been for all involved and how much had been learnt. As we reported last year (see 2012 News page) Hayling’s much loved lifeboat ‘Derrick Battle’ was taken for an extended refit last August, as part of the normal process to ensure that the lifeboat is in tip-top condition. The first replacement ‘Norma Ethel Vinall lasted less than a month with us when she developed a suspected defect in the essential strengthening ‘A’ frame and had to be taken out of service. The replacement Atlantic 85 ‘Peterborough Beer Festival III’ came as a replacement and has done good service for us since late August. Now this week on Wednesday January 24 we welcomed ‘Derrick Battle’ back to the Hayling Island Lifeboat Station and she went out on exercise that evening. 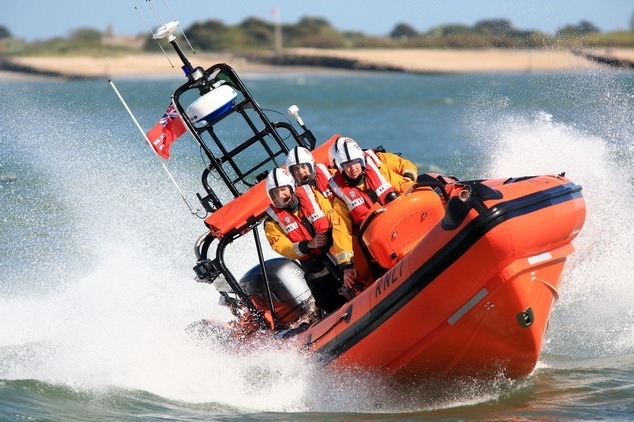 We are delighted to have the lifeboat with all equipment checked and fully functional and with any parts upgraded or reconditioned where necessary, and to know that we can be totally confident in the boat’s performance as we continue to save lives around Hayling Island. Trafalgar Wharf Ltd at Portchester extended its Christmas cheer to the Hayling Island RNLI Lifeboat Station in the form of a cheque for £100, raised by not signing 500 Christmas cards! Sales Manager Corinne Marshall (pictured 2nd from left) came up with the idea that instead of the 15 staff all signing the 500 Christmas cards to customers, they would donate a sum of money to equate with the man hours saved. The boatyard in Portchester has over 300 boats in its yard including The Drystack facility and is always keen to support a charity at Christmas. Corinne said ‘ We like to do more than just send greetings cards to our customers and because of the nature of our business, see the RNLI as an important charity to support. You couldn’t really be without the RNLI since the sea is a scary place.’ Each card, which was an RNLI card, contained a message explaining why they were not signed and an estimate that assuming each signature took 10 seconds equated to many hours of signing and lots of tired fingers!